Timothy Hallinan has been nominated for the Edgar, Nero, Shamus, and Macavity awards. He is the author of twenty widely praised books, including The Fear Artist, For the Dead, The Hot Countries, Crashed, Little Elvises, The Fame Thief, Herbie’s Game (which won the Lefty Award for Best Humorous Mystery), King Maybe, Fields Where They Lay, and Fools’ River. After years of working in the television and music industries, he now writes full-time. He has homes in California and Thailand. "For decades I've been looking to scratch my Fletch itch, and Crashed gave me hope -- it’s a well-written mystery with a smart, funny protagonist. I cracked open this sequel both hopeful that it would be as good and scared that I'd be let down. It didn't... Throw out everything you think you know about genre writing. Every word in this book belongs exactly where you find it." 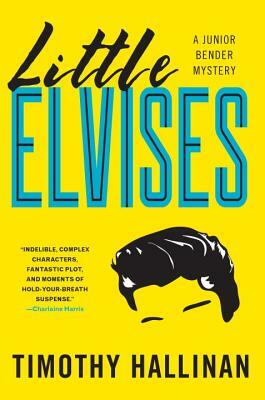 "Little Elvises begs comparison to Tom Doresey or Carl Hiaasen novels: It's quirky and hip, and often laugh-out-loud funny." have earned him comparisons to Donald Westlake and Carl Hiassen. Check it out now."